Like bananas, avocados come direct from nature wrapped in their own durable protective packaging. So why is a California-based avocado grower and distributor selling the savory fruits pre-peeled, pre-halved, sealed in plastic, and then wrapped in a cardboard box? Is cutting an avocado in half, and then scooping out the flesh with a spoon, really such a daunting task that it’s hurting avocado sales? Nearly every restaurant in the country will now put avocado on nearly any dish, so sales of the fruit must be booming. 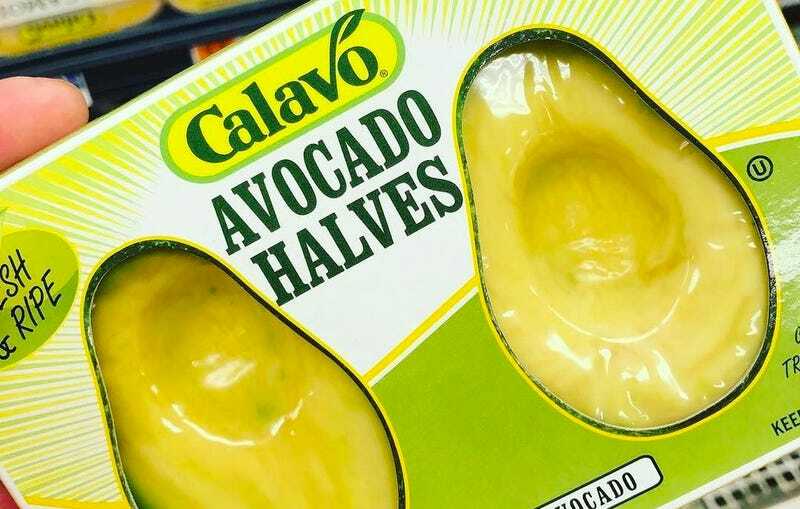 And before you dismiss this packaging as a prank, faked in Photoshop to enrage the internet, Calavo’s Avocado Halves are already popping up in grocery stores across the country, as Junk Food Guy’s Eric Huang discovered earlier today. But to anyone who’s ever bravely bought and consumed an avocado without any prior experience, it sounds like Calavo is simply trying to profit from consumers desperate for convenience who don’t mind paying three bucks for a single avocado, and don’t care about more discarded packaging headed to landfills. Why Is Amazon Packaging So Dumb Sometimes?